These photos were taken Christmas Day by my Sister-In-Law. I think they capture a good glimpse into how happy S and J were on that day! Today we went to see the Nutcracker ballet in Boston. Well, Nathan stayed home with J and the rest of us went. Thankfully it was a milder day and we didn't freeze too badly while downtown. S enjoyed a Starbucks hot chocolate in the Commons. We got to watch some building of ice sculptures for Boston's First Night. We all were very thankful that that was not our job! 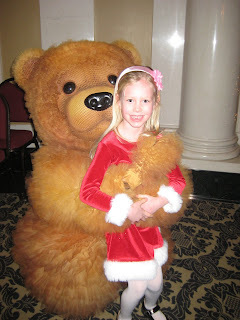 S got to have her picture taken with the Dancing Bear before the Nutcracker! and, S shared a hot dog with Grandma and Grandpa after the show! It was a fun day for all and the Nutcracker is a holiday must-see! Grandma and Grandpa arrived for a week long visit! S has already talked Grandpa in to taking her sledding and even J went along for a bit. 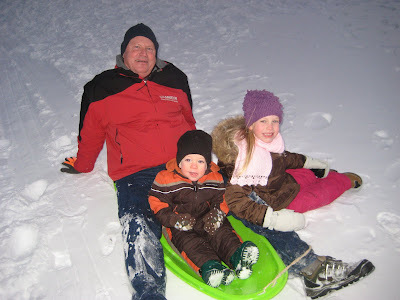 They all had a great time, but Grandpa came home and had to take some ibuprofen! Thankfully the blizzard arrived the day after Christmas. S was excited all day and kept wanting to play outside despite the high winds and bitter cold. I guess that speaks well of all the snow gear she's gotten over the past month! J has not been quite the snow lover that S has been. This maybe due to the fact that he can't walk too well in his boots and he takes his mittens off and his hands get cold. This is not quite what we had in mind when we put this sign up in our front yard last month! Oh well, at least the kids will get to enjoy the new sled they got for Christmas! Christmas morning started out with present opening, of course! S enjoyed her new scooter and J his new rocking horse. It took J a bit to figure out that the gifts were for unwrapping and once he did he wanted to fully enjoy that gift before opening another often shaking his head 'no' when we asked if he was ready for another present. S tried to encourage him as much as possible by helping to start the unwrapping part! After presents at home we drove to Newburyport for gifts and dinner with Nathan's family. Another wonderful time with the family. The 3 oldest cousins enjoyed Gami and Papi's Christmas train that goes in circles under their tree. They sat there for about 15 minutes just watching and waving to the train! The day ended with S and J tucked in their car seats for the drive home. Thankfully they slept late the following day. They were wiped out from all the fun! 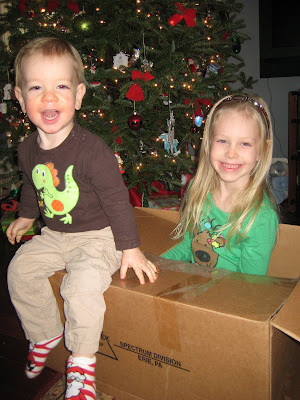 Along with the excitement of putting new presents under the tree, S and J enjoy playing with the box in which they came! I think it's time to to update the blog. December has been a busy month for us. But, it's been exciting to get prepared for Christmas. J has learned to say, "Ho Ho Ho!" S has already wrapped presents for the family and put them under the tree. Today is Christmas Eve Eve Eve Eve Eve and it's finally snowing for the first time this season. I'm about to take the kids outside to play in the dusting of snow and then I'm sure we'll come back inside for some hot chocolate!